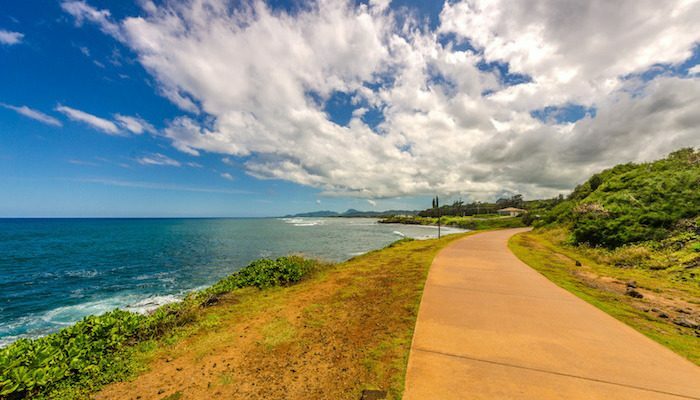 One of the newest additions to the running scene on Kauai’s east side, this 4 mile multi-use recreation trail translates to “the path along the coast,” making this one of the most scenic runs on the island. The flat, red clay surface winds along coastal cliffs with great views of the Pacific, where you may catch a glimpse of whales or dolphins in season. This area of the island, known as the “Coconut Coast,” spans from Lydgate Beach Park in the west to Kuna Bay in the east, passing coconut groves and historic pineapple canneries. The path runs from Waipoli Park in Kapaa, north to Donkey’s Beach in Kealia. There are access points at Nalu Road, Wailua Beach Park, and Kealia Beach if you want to shave some miles off your trip. There are restrooms, picnic tables, and lookouts.